Sri Chinmoy is a spiritual teacher, who dedicated his life to serving humanity through his prayers and meditations, as well as his musical, artistic, sporting and literary works. He was born in 1931 in East Bengal. At the age of 12 he joined a spiritual community in South India, spending his time in deep meditation, service, and sports, and attaining a very high level of spiritual realisation. In 1964 he received, through his meditation, an inner calling to bring his spirituality to the west. From then on he lived in Queens, New York, and now has over 300 meditation centres all over the world. His teachings give a very practical approach to meditation and the spiritual life, demonstrating how meditation need not be restricted to the Himalayan caves, but can be woven into western and modern life. 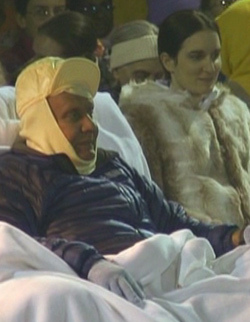 From 1970 to his passing in 2007, Sri Chinmoy held weekly meditations at the United Nations. Even well into his 70s he travelled around the world offering free concerts, of which he gave over 700. An accomplished athlete in his youth, Sri Chinmoy practised weightlifting until the age of 76, in the hope of inspiring others to transcend their physical boundaries. He is the inspiration behind the World Harmony Run as well as many races worldwide, from 1 mile to the longest foot race in the world: the Self-Transcendence 3100-mile Race. 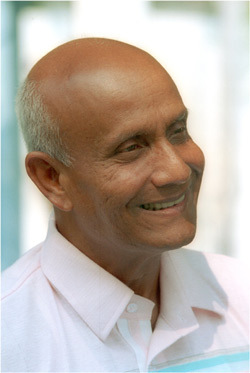 Sri Chinmoy was a prolific writer throughout his life. From short meditative aphorisms to in-depth spiritual questions and answers, plays and ancient instructive stories retold for the modern world, he has published around 1500 books in several languages. Music played a very significant part in Sri Chinmoy’s life. He performed on many musical instruments, and wrote over 20,000 songs, in English and his native Bengali. Sri Chinmoy passed away on October 11th, 2007, leaving behind a legacy of spiritual teaching and creative works of inspiration. Despite its intensity, nobody remembers being born. Everyone uses their first breath to cry. Raw sound, cold, movement, pain, exhaustion, separation from the source, are too much to bear at once. There is no strength of one’s own to call upon, and nothing certain or familiar on which to depend. Abraham Lincoln, Queen Victoria, Albert Einstein, Muhammad Ali; however mighty they became, each arrived naked and alone, and they cried. My primal bewilderment stayed with me longer than theirs, and perhaps longer than most. The cry silenced, but was always there. Life was a fast road and the human vehicle seemed so fragile on it. I saw pain in others and felt it as my own. I grew no armour in my thoughts or senses. I was a morbid child – my first dream in colour was of death. I lay awake in fear of everything, craving the release of sleep, but dreading my own dreams more than waking life. So I made my first tiny flame of peace inside. It lit my world a little in that strange perpetual night; spilled into the darkness so at odds with my safe and gentle circumstances. I worried about life and the end of it, about the world and myself in it, about being small and about growing up. I worried that God had forgotten me on earth. That’s perhaps the strangest thing. I was raised an atheist but always secretly believed in God: that there was more to life than earth, that death was not the end of it. Thank God for that. It was a vague belief though, like a church bell ebbing and gathering on a faraway breeze, or a photograph faded almost to obscurity. There was nobody to sharpen the image for me. To admit to another that I believed in God, and needed to feel closer to Him, would have seemed weak. Delusional even. Like admitting that I couldn’t handle myself. But nobody knew anyway. Nobody knew where we are, or even how far the universe goes. Nobody knew for sure what happens after death. Nobody knew where God is. It didn’t seem to bother anyone, and that bothered me most of all. I blundered through my teens as well as anybody can, still haunted by fears I couldn’t name, increasingly sensible to the vulnerability of a world I didn’t understand. As I grew, so did the dark. I was trapped in it, a slave to my own fear. The faint memory of God was swallowed in it too, and I was terribly alone. Luck has a habit of following me, especially when I need it most. A lady where I lived had taught herself to meditate, and gave me some books so I could do the same. She talked about God naturally, like a friend. The picture grew in clarity again, in brief glimmers. Through each attempt, I collected strength beyond my own ability, harvesting happiness from an orchard much more bountiful than my own – an orchard of sweet fruits that went on forever, where it was always summer. I dared remember that my life is not a solo voyage, but piloted by Someone bigger. At last I could breathe, as if for the first time. One day I turned against fear, and it dissolved, like a serpent made of smoke. God had not forgotten me; I had been forgetting Him. I was a fair-weather friend to God though. Meditation was difficult. Although I practised every day, my efforts lacked vigour, unless I was desperate or in trouble. I reached an agreement – a sort of dual tenancy – with the serpent of smoke. It was always there, but it would keep to its own quarters. God lived somewhere upstairs, and I was often too idle to climb there – perhaps calling a perfunctory hello from the second step each morning. Courage came then from more comfortable sources: the sort you can buy in a bottle or a pill, that you can win through fickle friendships and small outer victories. It was a cheap happiness, and like most imitations, it fell apart after a few years. I chased it all over the world, but arrived back where I started, and that time with nothing. I suppose it was a new birth, a blessing in the form of annihilation. There was an accident which nearly took my life. Soon after that I had no money, no job, no family near me, no friends, no home, barely any belongings, and not a shred of hope or self-esteem. 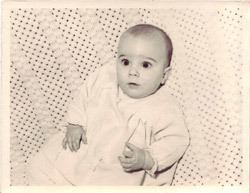 I was helpless as an infant, and I cried a good deal. I knew I had to learn to meditate properly. I had to find someone who knew how to do it and could show me. I dug out the books the lady had given me and tried a new exercise: The Spiritual Guide. It started with imagination, as all visualisations do. I waited on a beach in my heart for someone to come and teach me, and eventually he did. He was a beautiful Indian man, all softness and sweetness, but with the strength of a galaxy contained in a human form. He loved me, as if he had known me always. He listened and understood, without judgment or harshness. He encouraged me – sincerely, not indulgently, and not in words, but in silence, releasing wisdom and peace like fragrances. I had only to breathe them in. Here was someone who knew. He knew God. Anything I did not understand, he already knew. He did not need to tell me; the fact that he knew was enough for me, to see it and feel it in him. He contained all opposites, extremes of all I had longed for: subtlety and certainty, beauty and practicality, and most of all, immaculate poise. He did not answer me or solve anything directly, but having sat with him, I knew what to do in life, and felt the strength to carry it out. Over the span of a year I gained a good job, a car, and a beautiful home. I was safe and healthy, challenged by the world but no longer terrified by it. I wanted to learn more, to meet with others who knew meditation’s secrets. I wanted to practise with them, find new techniques, exchange experiences. The Sri Chinmoy Centre was the first and only place I found. I thought it had been my own imagination. How could such a man exist on earth as the one who had sat with me every day that year? There he was, in photographs and videos. He had come to life. He had been there all along. I could read his words and sing his songs. Eventually I could sit in his outer presence, as I had done so many times in my heart. I cannot account for my good fortune. I am small and full of imperfection, but divine love touches all creation like the fingers of the sun. Luckily we need not wait to deserve it. In Sri Chinmoy I found answers to questions I had not yet formed. In his brief life of 76 years he gave to all equally and abundantly: not what was deserved but what was needed. In poetry, in songs, in physical demonstration and silent meditation, he made maps for us: maps of immediate inner lands, and others we will not reach for a very long time. Sometimes I miss him. I had ten years to become attached to the luxury of his living presence. But I know he has given me much more than I need, and much more than all the world can give me. When I miss him, I know I need only sit in my heart and he will come to me. Hi, your story is one of the most amazing I have read! Beautifully written. I’m not even going to try and tell you how much I liked it. Just know that it made my day. Thank you so much for your comment, Antara-Prabhat – it made my day too! Beautiful, soulful, sensitive, living edge between heaven and earth, luminous, sparkling and full of inner cries and upward movement. Mount Kailash, Mount Everest, Mount Kilimanjaro, the inner height has no limits, it is endless, and deep like the oceans. Thank you so much for your beautiful comment, Husiar! Shivani, thank you so much for taking the time to read this story and to offer your kind comments. They really touched and inspired me in return. Thank you again. Sumangali, this story of yours brought tears in my eyes. Thank you so much. This experience really has touched and inspired me deeply. It is surly a great privilege that I got to read it. Thank you. I love your story. You write beautifully. I am not much of a reader at all – just a skimmer of headlines and photo captions here and there and in the end finally finding more delight in images alone. Anyhow, the good thing is that I can not pull my eyes away from the page when it comes to reading many of your accounts and stories. Thanks for sharing your gift of the written word! p.s. no website attached to this comment just wanted to share my joy in reading your works. I found your self-reflection incredibly moving. We are each drawn to mysteries we perceive throughout our existence. Sometimes it helps to reflect back on how we understood our life before now. Yet, ultimately, we discover a real power in focusing on how we feel and live in the now. Thank you for visiting, Henry, and for your heartening comment. Very nice to meet you. very simply and beautifully written – I can empathise with so much of what you recount. Thank you for your kind words, John. I am truly humbled and honoured by them. Sumangali—what words shall I choose to praise adequately this road-map of your heart, and portrait of your soul? You are brave beyond in words in portraying, nay painting with photographic precision your inner life and journey—where you have come from, are now, and have still to go, painting such with lustre, colour and spirit a story more most precious jewel, and diamond of the heart. It is beyond a pleasure to share this your heart in words, a privilege to humbly own. Shardul, your response is a beautiful and inspiring article in itself. Thank you so much for taking the time to write such a heartfelt message. I am sitting in Auckland train station with a little time on my hands before I play flute for the lunchtime crowds on this beautiful summer’s day. Having found a wireless connection, I came across your article and have been transported to another (and much higher) realm by it. Delight, delight, delight! Thank you for writing something so honest and meaningful ; so touching and poignant; so heartfelt and illuming. You write so beautifully and capture so much the feeling of Sri Chinmoy’s love for the world and his for students. Our friend Bipin is visiting Auckland at the moment and we are very privileged to have him here. When asked to speak about his experiences of being with Sri Chinmoy over the last three and a half decades, the one theme Bipin kept spontaneously returning to was Sri Chinmoy’s immeasurable love and concern for his students and for humanity. This love is something that was expressed very powerfully through his various activities but the souls that spent a lot of time around him saw it most powerfully on a firsthand and personal level. Everything he did was for the inspiration and betterment of others. What a beautiful life. And how fortunate for the world to have had the presence of such a God-loving man. Thank you for your visit, Tejvan. Glad you enjoyed the post.